I never had a spider bite before, but I knew something was wrong when I woke up in middle of night with a huge red lump, pain and itching. It was on the weekend, so I decided to go to the local drug store in the morning to show it to a pharmacist. She couldn’t give medical advice, but suggested I see my doctor on Monday, but during the weekend take an anti-inflammatory as well as something for pain if needed. She recommended I keep it covered and if there was fever or more severe symptoms to go to an urgent care clinic to get an antibiotic. During the day it seemed to get bigger and was quite warm to the touch. I spent time looking at natural remedies online and made a paste of salt and baking soda. I left it on for about 15 minutes and washed it off. Then I took a bath in epson salt and when I came out there was a yellow discharge (I won’t get too graphic here)! It seemed “better”. I covered it with antibiotic cream and continued on my day, doing errands and making a beach stop a well to sit and look at the waves. At night it blew up again and the next day the size seemed bigger, harder and definitely not improving! I did my paste again and there was a little discharge, but not too much and the leg continued to be both painful and itchy. I read about the dangers of the brown recluse and the black widow, but didn’t know what kind of spider it was as I didn’t see it. The brown recluse spider can have a serious impact on the kidney if not treated properly. I wasn’t able to get a doctor’s appointment for a few days, so continued with my pastes, antibiotic cream and baths as well as pain relief over the counter a few times a day. 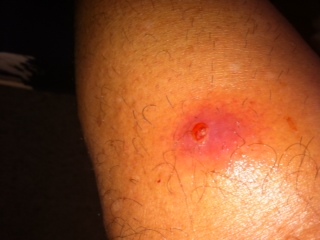 I went to work and curious co-workers looked at it diagnosing it as possibly staph or MRSA and getting me very nervous. When I finally did get to the doctor’s appointment he gave me a cortisone cream and an oral antibiotic. The bite continued to stay warm and grow and I kept going to work and not knowing if things were improving at all. I also tried putting on potato slices (this is an old grandma remedy for drawing out infections). Each doctor’s appointment had a forty dollar co-payment so I was reluctant to go, but I didn’t feel things were improving and was hearing different horror stories about friends of friends who had to have surgeries when their spider bites didn’t improve. I went back to doctor and was given a second antibiotic and told to keep with the epsom salt baths as well. He is in his seventies and has seen everything. A friend of mine who tries a lot of natural remedies told me that he has used PRID for bad skin issues. I was able to find it at Walgreens and it is a tiny orange container that has a clay-like substance. The ingredients are: Carbolicum Acidicum 2X HPUS, Ichthammol 2X HPUS, Arnica Mont 3X HPUS, Calendula Off 3X HPUS, Echinacea Ang 3X HPUS, Sulphur 12X HPUS, Hepar Sulph 12X HPUS, Silicea 12X HPUS, Rosin, Beeswax, Petrolatum, Stearyl Alcohol, Methyl & Propyl Paraben. It is homeopathic and if you can’t find it at your local drugstore you can find it online HERE . You can read the reviews as people have mentioned it for cysts, boils and splinters as well. Evidently, it is a drawing salve. I used it with a Q-tip. It is also quite inexpensive. I still also did the baths, antibiotic cream, cortisone cream, antibiotics and some baking soda/salt pastes for good measures. If you have a bite, please get it checked as there really are some frightening stories about people getting MRSA or having the problem get into the muscle. It is nothing to overlook! I didn’t try other home remedies, but some I read about included mixing tumeric and olive oil, applying banana peels, tea tree oil, taping garlic, charcoal poultices and others. Please be sure to see a doctor. It took over 6 weeks for it to resolve and it was pretty big for 4 week before I was sure it was starting to heal. In fact, it would pop and discharge and then the center seemed to move 1/2 inch to the right and start over again! Something so small, can do quite a lot , so don’t underestimate it. This entry was posted on Saturday, December 12th, 2015 at 3:50 pm	and is filed under spider bites. You can follow any responses to this entry through the RSS 2.0 feed. You can skip to the end and leave a response. Pinging is currently not allowed.